Birman Cat is a domestic cat breed. It is not to be confused with the Burmese, which is a quietly separate breed. 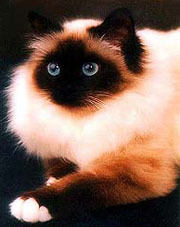 It is difficult to find clear records about the origin of Birman cats. While legend claims that Birmans were kept by temple priests in North Burma, there are many factual and historical errors in this claim. Also, this legend borrows heavily from that of the Siamese cat. In any case, a few Birmans were brought to Europe in the late 19th century and they thrived because of the effort of a few breeders. However, they were almost wiped out during WWII, with only 2 surviving Birmans. This pair is the founding pair of post-war Birmans. The Birman cat has a long, stocky body. It has semi-long hair, which is silky. While the hair is not as thick as that of a Persian cat, it has a texture that never mats. Their coat is typically light in color, golden or eggshell white. Their coat is unusual because they have white ‘gloves’ on each paw. Their markings can be chocolate, blue, cream, lilac or pure seal. They have comparatively small ears and a Roman nose. They have beautiful sapphire blue eyes that remain blue throughout their lives. Had a Birman female. Very loving cat. Great with kids.